The University of Houston-Downtown's Center for Critical Race Studies is hosting, "Mental Awareness: Critical Conversations in the Black and Latinx Communities," from 6 to 7 p.m., on Tuesday, May 22 in the Welcome Center's Travis Room. 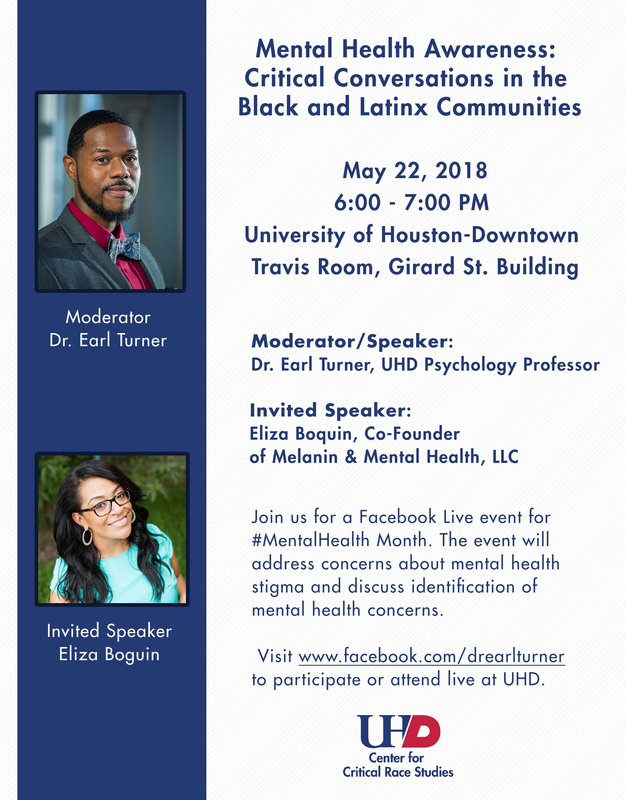 UHD assistant professor of psychology Dr. Earl Turner will serve as moderator and speaker along with guest speaker, UHD Alumna Eliza Boquin ('00), co-founder of Melanin & Mental Health, LLC. The Facebook Live event (#MentalHealth Month) will discuss shame and address concerns about around mental health stigma in the Black and Latino community, ways that therapy can be useful, and tips on identifying when to seek treatment. Visit www.facebook.com/drearlturner to participate or attend the live.